BillCutterz » Money Saving Articles » What’s Up with This FIRE Movement? 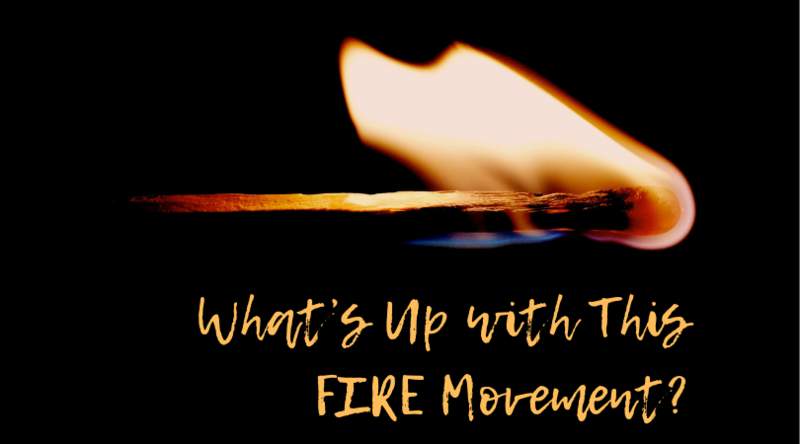 Have you heard of the FIRE movement yet? I’ve heard of it in passing a few times over the past couple of years, but it seems that recently it’s getting a lot of attention. In case you haven’t heard of it, it stands for Financial Independence, Retire Early. Sounds like a pretty good plan, doesn’t it? I’ll hit some of the highlights and provide links to in-depth information, too. First, let’s talk about what retirement means, and how early is early. Because, once again, it’s different for all of us. My parents are retired, and I’m betting that in your mind retired = old(er) people. My father has actually retired from more than one job, for someone of his generation that’s unusual. In my generation (tail-end Baby Boomer), more jobs are more normal, and in subsequent generations it’s downright common. However, changing jobs often means losing retirement benefits and/or having to move retirement savings. Part of the FIRE idea is that you should manage your own retirement funds, and since you are planning to retire early (some retire in their 20s), you probably don’t want to use typical retirement savings that are tied to age. Another part of the FIRE plan is you get to choose if you want to work at all. More than likely it means not having a permanent job. Many people choose to do consulting, freelancing, or have a small business of some sort to supplement savings withdrawals & provide a creative outlet. So, retiring in this context is more accurately described as no longer having a traditional full-time job. An extremely young retirement probably means that you will have to continue to produce income in some way or run the risk that your savings won’t hold out long enough. The basic formula I have seen is that you need 25 times your expenses in savings and should only plan to withdraw 4% a year. If you don’t want to do the math, that means if you assume you can live on $40,000 a year, you will need a million dollars in savings and will need to earn 4% on that money every year to maintain your savings. That’s a pretty huge number to put aside if you don’t make a lot of money. That brings me to the “how to save that much” part. Some of these sound difficult and drastic, but with some aggressive budgeting (another FIRE tenet) it’s doable. The main idea is to spend far less than you bring home and put money into savings to support yourself later. The second part of saving in the FIRE movement is to find the highest paid job you can and live like you are barely scraping by. Imagine if you had a job that paid you $200,000 a year, your take home would be somewhere around $135,000 (a rough average of the rates in every state). You could live pretty well in many places on that amount of money, depending on the cost of living. Now imagine you put 50% of that away for the future, it would take you about 15 years to get to a million dollars. That’s actually faster than I would have thought. I know that here in my medium cost-of-living city, I could live very well on a take-home of $67,500, especially if my expenses were low. The hardest expense to cut is housing. One of the best ways to cut that down or eliminate it is to have a rental property that takes in more than it costs to own. Owning a duplex and renting half for the entire mortgage payment is a great way to do this or owning a fourplex that pays for itself and then some. Another way to cut housing expenses is to live in a smaller place than you may want. Over the past ten years, I have downsized in steps from a 4000 ft2 home to 1020 ft2. It’s been a challenge at each reduction, but the rewards of smaller space living are worth it. My electricity, insurance, lawn care, and general maintenance costs are all lower. Plus, in a small space, you are less tempted to shop because you don’t have discretionary storage! What will you do in retirement? You could travel, read more books, spend time gardening, learn how to cook, spend more time with your family, or focus on a hobby you wish you had more time for. What would you do if you could retire early? All the same things, I imagine. I’m aware that our readers aren’t all young, but these ideas can work at any age. If I could put aside a million dollars in 15 years, I would still be able to enjoy retirement. Remember, time passes whether you make a change or set a new goal or not. I’m choosing to look at a new mindset about saving and spending as empowering myself for the future, rather than it being an overwhelming goal that I might not achieve. While our Savings Experts might not save you a million dollars, they can certainly help you reduce your monthly expenses. Take a few short minutes to sign up and submit your bills and let us go to work getting you the best rates on your bills!